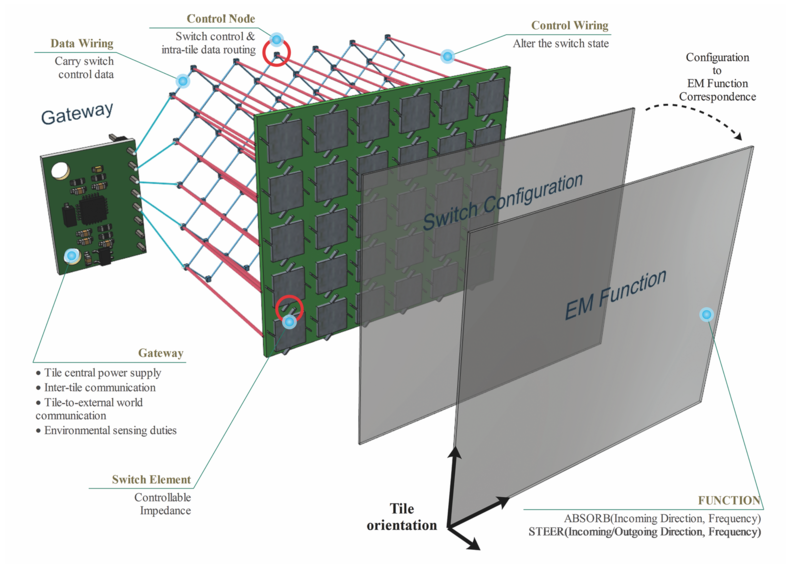 VISORSURF's objective is to develop a full stack of hardware and software components for smart, interconnected planar objects with programmable electromagnetic behavior, the HyperSurfaces. The key-enablers are the metasurfaces, artificial materials whose electromagnetic properties depend on their internal structure. HyperSurfaces merge metasurfaces with embedded electronic control elements and well-defined software programming interfaces and tools. The control elements receive external software commands and alter the metasurface structure, yielding a desired electromagnetic behavior. Metasurfaces, thin and planar artificial structures, have recently enabled the realization of novel electromagnetic and optical components with engineered and even unnatural functionalities. These include electromagnetic invisibility of objects (cloaking), total radiation absorption, as well as fine-grained manipulation of impinging electromagnetic emissions in terms of direction, polarity, phase and power in a frequency-selective manner. Nonetheless, metasurfaces do not offer a well-defined way of integration to products and interconnectivity to the Internet of Things. Designing and operating metasurfaces remains an extremely specialized and undocumented task, limiting their accessibility and use within the broad engineering field. VISORSURF proposes a hardware and software platform-the HyperSurface-that separates usability concerns from the underlying physics. The HyperSurface Application Programming Interface (API), which exposes supported electromagnetic behaviors—such as wave steering, absorbing, polarizing—in simple, well-defined parametric callbacks, allowing for transparently hosting multiple functionalities concurrently and adaptively. A switch-based fabric array as the electromagnetic medium, incorporating miniaturized, low-power Application-Specific Integrated Circuits (ASICs) as embedded control agents. A Graphene-based prototype, making use of its exquisite properties to provide finer, frequency-selective electromagnetic control. Real pilot-applications will demonstrate the HyperSurface potential to adapt to changes in their environment, to interconnect to smart control loops in the IoT world, and to make use of Information Technology (IT) programming concepts and algorithms in crafting the electromagnetic behavior of materials. Analysis, design, implementation and evaluation of metasurfaces. Advanced, massive packaging and integration of electronics. The novel inter- and intra-networking capabilities provided by HyperSurfaces. Theoretical performance bounds and scalability analysis of existing and future technologies—such as nanonetworked control agents—for building HyperSurfaces. Applications of HyperSurfaces, such as the Programmable Wireless Environments which promise customized propagation of electromagnetic emissions for advanced wireless performance, power transfer and security. The broad theoretical and experimental expertise of the proposers, together with their field-shaping past contributions, make them capable of facing the challenges involved, ensuring the success of the project.